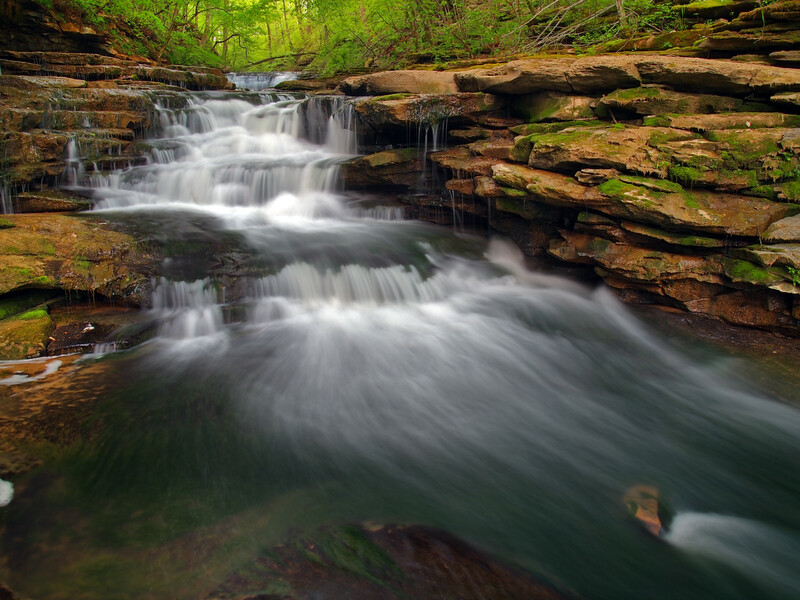 Ahhh, the waterfalling season is back and with it comes the Kentucky Waterfalls Website: Waterfalls Vol. 3! 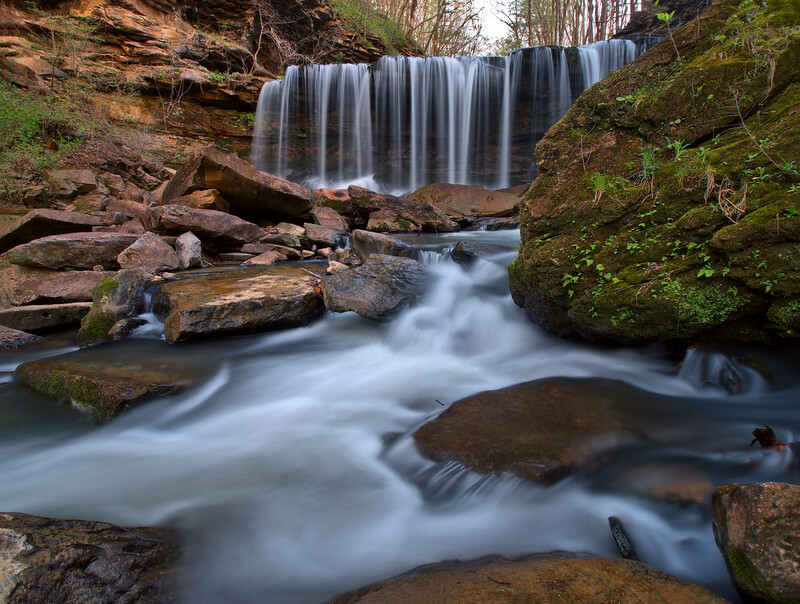 In Volumes 1 and 2 we started at Anglin Falls near Berea and ended with Princess & Lick Creek Falls in and near the Big South Fork National River and Recreation Area. This time we’re going to pick up where we last left off. Starting at the Princess/Lick Creek Falls area and make our way north into Wayne County and the tributaries of Lake Cumberland. So this list can be used along with the first two volumes to make one massive waterfall tour! 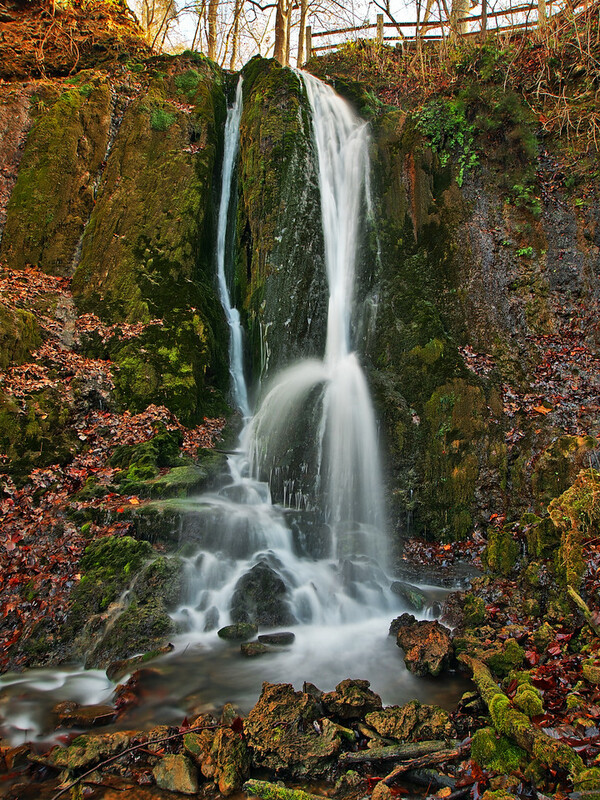 So get out the waders, grab those cameras and let’s go waterfalling! From the Sheltowee Trace/Princess Falls trailhead follow KY 92 West into Monticello and make a right onto KY 90 East, then after a short distance turn left onto KY 1275. Be sure to bring a lunch for this first stop on the tour, especially if you are a photographer! There is plenty to see here! 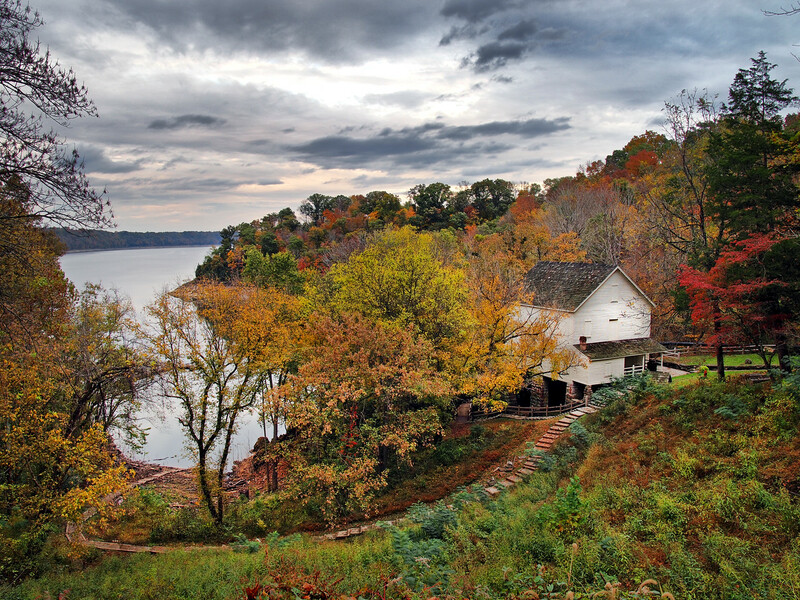 Resting on the banks of Lake Cumberland at the historic Mill Springs Mill is a pure joy. The mill is a fully operating mill and is located on State Route 1275 about 7 miles north of Monticello. If you decide to visit by boat, the mill does have a boat dock. There is ample parking at the mill, or if the lot is full you can park above it, roadside near the Brown-Lanier house. The Mill is open late Spring through early fall, 9 to 5 daily. Corn is ground on Saturday, Sundays and holidays at 2 pm. Tours of the mill are also offered. Constructed in 1877 the mill has a 40-foot overshot water wheel which is the largest of its kind in the world. 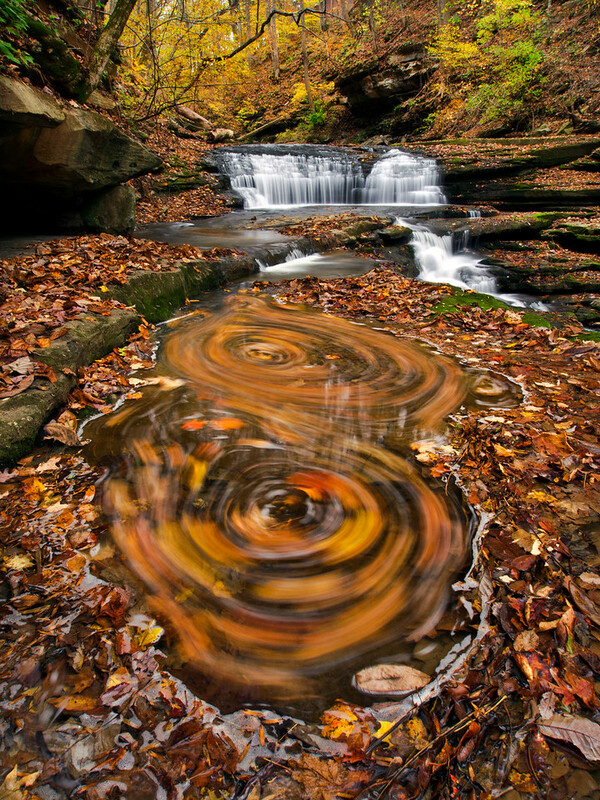 It is said that there are 13 springs that emerge and cascade in several directions before meeting to make two distinctive 30-foot drops into Lake Cumberland. 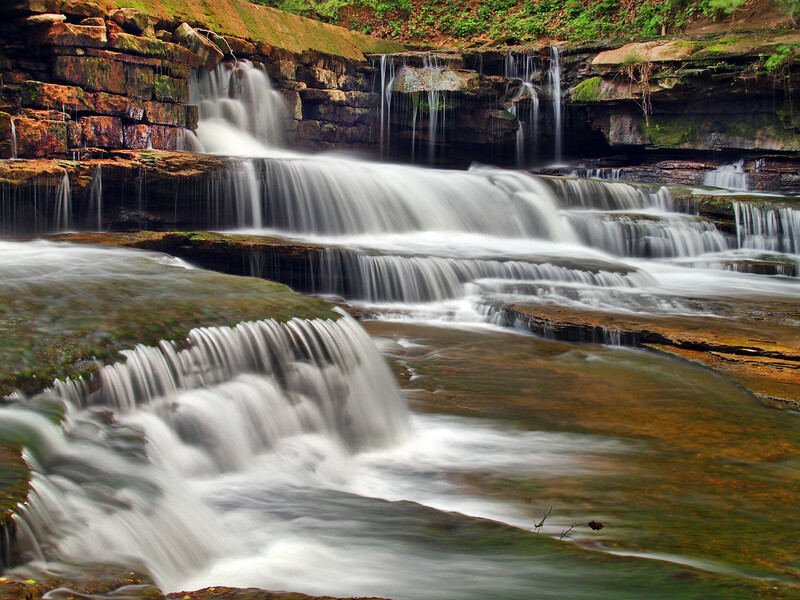 The cascades are very beautiful and offer numerous compositions to a photographer. A tall split rail railing surrounds a concrete pathway around the cascades and the Mill Springs Falls. There are no signs indicating you that can’t cross the railings to get closer. 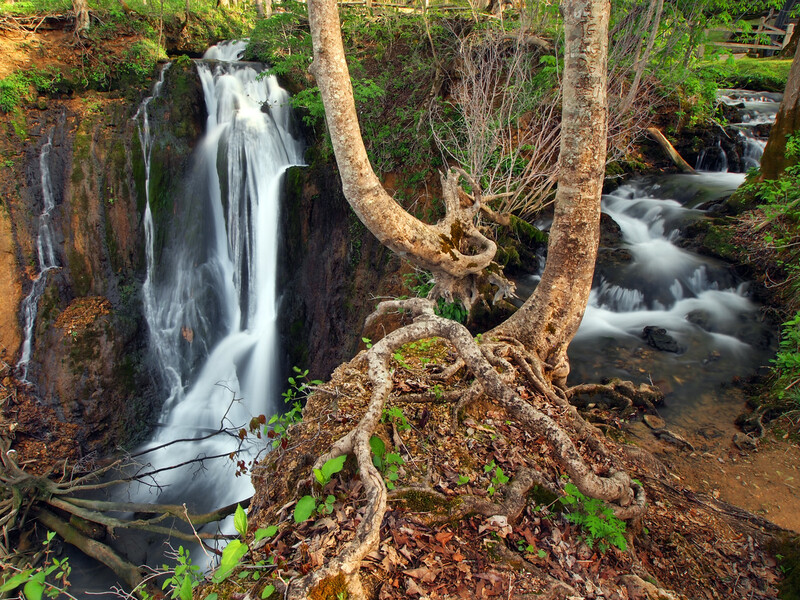 Mill Springs Falls offers some challenges to fully photograph or view them. 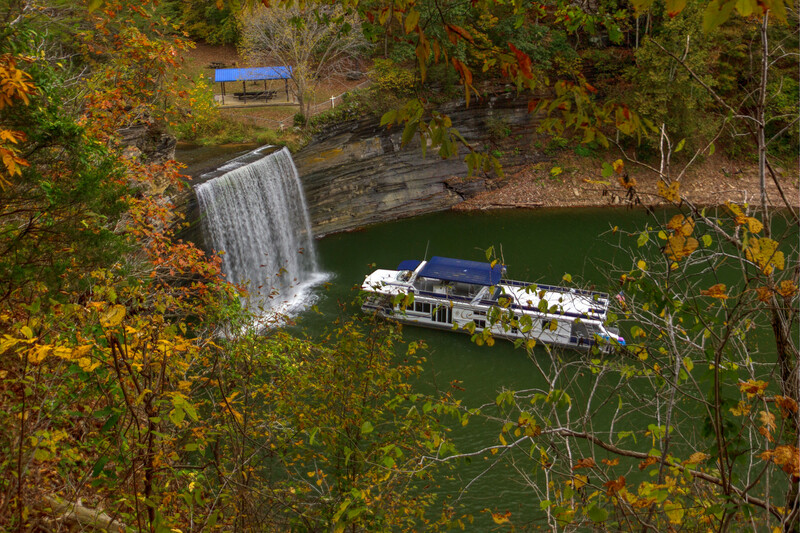 To be honest, they are best viewed by boat on Lake Cumberland, however if you do not have that option the best places to view them are from behind the mill where you will have to cross the railing, step into the creek and then walk out on a thin outcropping that looks down upon both falls. Another option is to cross the railing by the cascades, cross the creek, walk into the woods and then make your way down the lakeside (if the water is low) and view them from there. Either way, be careful! The surrounding landscape is very unstable and you can see where it’s constantly falling into the “splash-pool” of the falls. For more information on this waterfall, including the location, click here. So what‘s better than visiting Mill Springs Falls? Not having to drive your car to our next waterfall destination on nearby Meadow Creek! If you are parked in the lot at the mill, head up the stairs towards the visitor’s center and make a left towards the historic white house named the Brown-Lanier House. Then make your way back the driveway. If you are parked above at the visitor center head back the driveway to the right. During the summer months, you can tour the house on Thursday through Sunday. Constructed in three different segments from 1830 to 1860 the structure served as the headquarters of the Confederate Army during the winter of 1861-62 during the Civil War as the battle of Mill Springs was fought nearby. Later it would become a Confederate Hospital and eventually, it would serve as a Union Headquarters. If you are not interested in the house, to get to Meadow Creek, continue back the driveway then stay to the left of the natural hedge/tree row where you’ll see that it opens up to the left into a small field. Once at the end of the row, turn left at the Civil War Marker and into the field. Once you are close to the midway point of the field, start to make your way down the hill. Notice the lone gravestone off to the left. At the bottom of the hill, you will see a faint trail entering the tree line and you should hear the falls. Once entering the tree line the undergrowth opens up and you should be able to see the creek down the hill below. As you make your way down the hill be careful of the old barb wire fence that will be lying on the ground. Recent rainfall will dictate your goals. If there has been a lot of rain, the main falls is a must see. At 35 feet tall, it is an impressive sight to behold. The falls are easily viewable along the creek wall from above, however, it is up to you if you want to make your way to the base. Depending on your skill level it will be from hard to moderate. If there has been less rain or during drier times, the falls is far less impressive. Less rain can be good, because if the main falls aren’t flowing all that great, then above are the Meadow Creek Cascades. 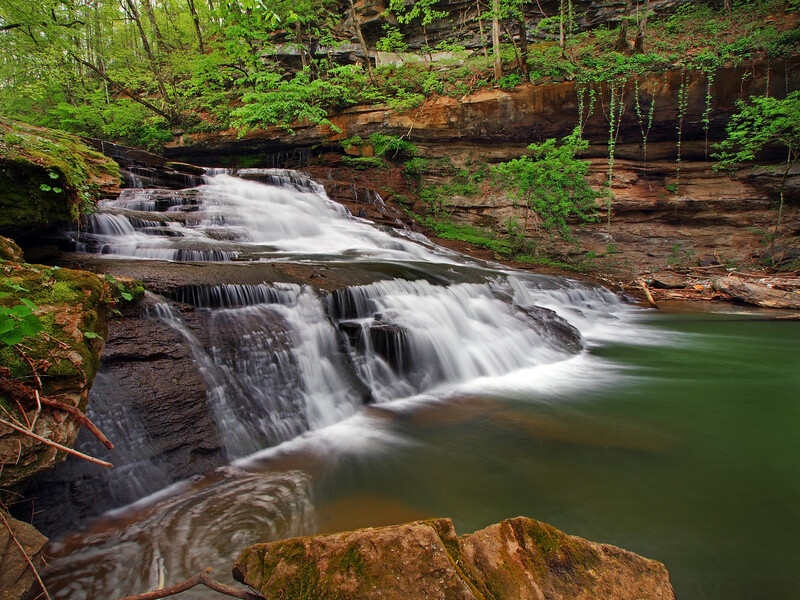 They are a series of four, 3 to 6-foot tall waterfalls that stretch several hundred feet upstream. Follow the trail upstream from the main falls. Take notice that the barbwire fence is now standing, so be aware. If you are uncomfortable with how close the trail passes by the cliff above the main falls, there are some places to hop over the fence and walk uphill from it. From here you can see upstream and it is pretty obvious what is in store. In my opinion one of Kentucky’s most beautiful streams. Make your way down to the creek and from there go where ever you want. For the most part, climbing down to the first cascade and going on upstream, to the other falls, is fairly easy. For more information, including the location for the main falls, click here. For more information, including the location for the cascades, click here. When you make your way down to see this beauty, just outside Monticello, you are going to ask yourself, “How the hell did I not know this was here?” Especially if you live in the area. From Mill Springs take Old Mill Springs Road, directly across the street from the mill, and then make a right onto Kentucky 90. Follow Kentucky 90 through Monticello. After passing through town the road will begin to slope downhill. Look for the Grace Baptist Church on the left. The road will then veer to the right. Look to the left while in the curve, as a guardrail ends at the road cut. That is where you want to park. Once parked, walk up the embankment and make your way to the right and over the hill. There was a trail here that went off in different directions. I ended up just off trailing down over the hill. If you notice, the creek below is standing water. That is because this section of the creek is impounded. The falls are further downstream. Continue down the hill to the right and you will come to the side of the falls. The falls begin at the dam, and the dam itself offers some cool waterfalling as well. The upper section of the falls offers several smaller cascades before steeply sloping for 50 feet or so. A trail follows along the falls to the base. If you are up for some creek walking and some adventure you do not have to drive anywhere. Jock Falls is around the corner from Town Creek Falls and is a nice little side trip. 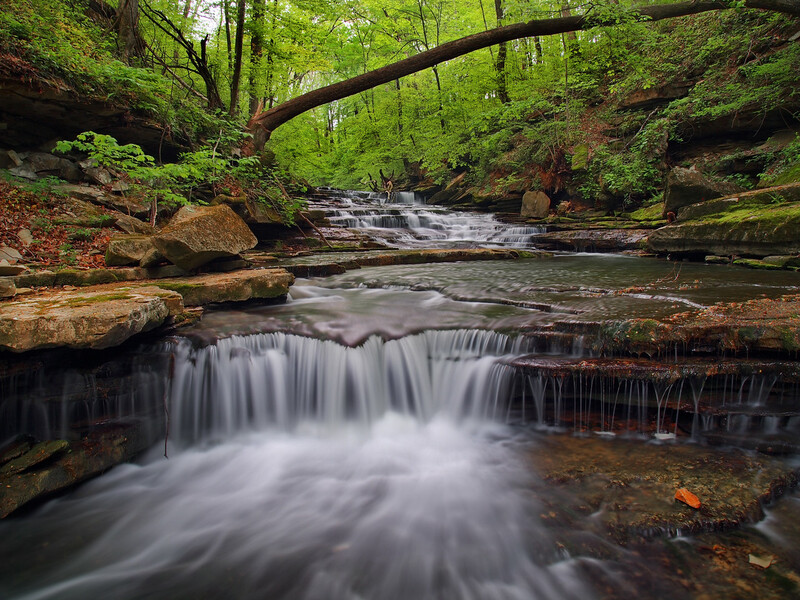 It is a 3.2-mile round trip hike from the base of Town Creek Falls to Jock Falls. Waders are recommended, as in some places the water will get over waist deep. Also, keep in mind if there has been a recent heavy rain or high water you will want to not make the attempt of the creek walk. Jock Falls is located on Beaver Creek. 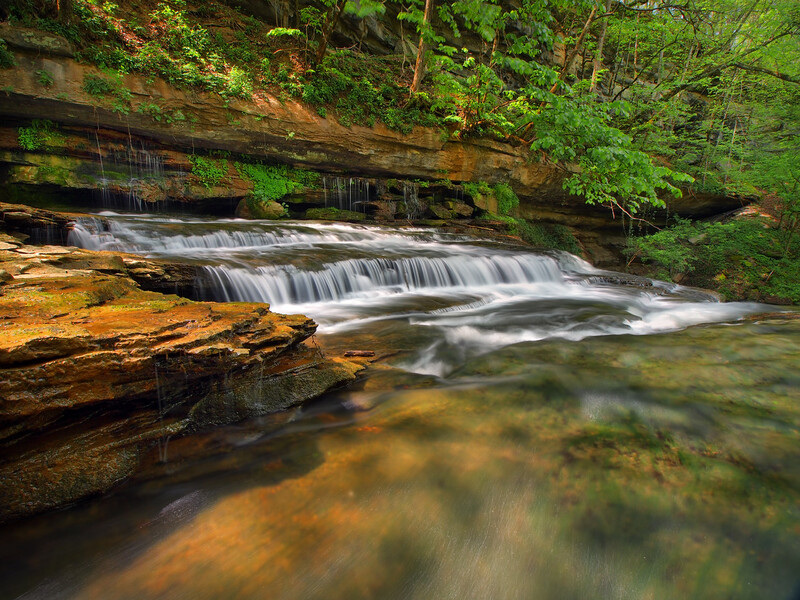 Essentially, from the base of Town Creek Falls continue downstream to where Elk Spring Creek meets Beaver Creek make a left and follow Beaver Creek upstream. 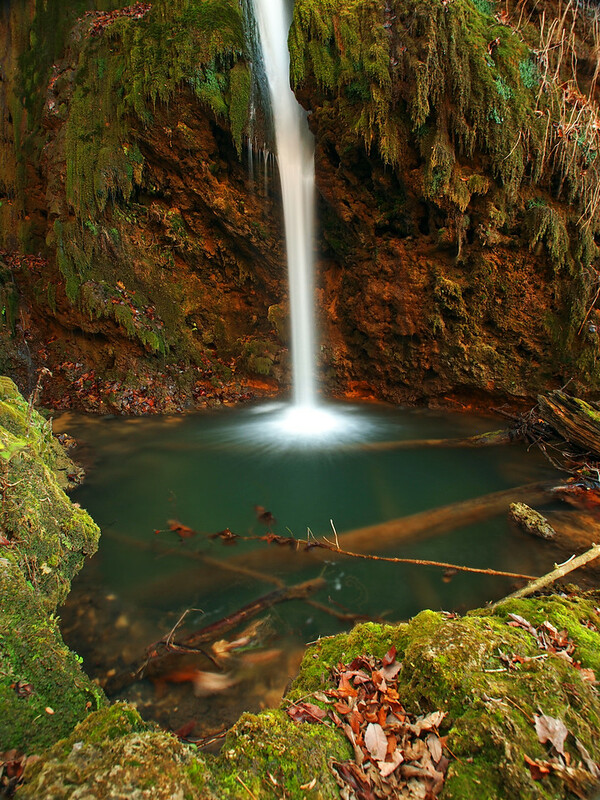 Even though Jock Falls is a shorter falls, it is a creek wide waterfall that is quite beautiful. The last waterfall on our tour is also one of the state’s more popular, as this waterfall drops directly into Lake Cumberland. There are two ways to visit this waterfall; one is by water and the other is by land. Though one would think the name of the waterfall is its actual height, it is not. Evidently, it is located near the unincorporated community of Seventy Six and that is how it got its name. If you visit by water, I think it is the best way to view the falls. However during the peak summer vacation months, getting a decent photograph may be hard to come by as the falls is usually surrounded by numerous boaters. After all, it is one of the most popular lakes in the United States. Also, water levels in the spring and summer months are higher cutting the height of the falls nearly in half from the fall and winter months. By land is the other option, and from Monticello, it is not very far. If you are at Town Creek Falls, head West on Kentucky 90 and make a right onto Kentucky 734. Then quickly veer onto Kentucky 3062. Follow 3062 until you see a long paved pull-off on the left. This is where you park. At the very end of the parking area, there is a set of stairs with a wooden railing heading below the parking area. After following the steps at the parking lot you have several options to view the falls. A fence has been constructed at the nearest sections of the falls, however, if you branch out to the left or right along the cliff line, there are several half unobstructed views of the falls. There are paths that lead to lake level offering some good views of the falls, but depending on your skill and the season, lakeside views can be completely impossible. Remember!, during the late spring and summer months, water levels are higher at the lake. Whereas in fall, winter and early spring, water levels are lower. Also, keep in mind there are some cascades upstream from the main falls worth having a look at. That concludes the Southern Kentucky Waterfall tour! From Berea’s Anglin Falls in Volume 1 to 76 Falls on the western edge of Lake Cumberland. 16 total waterfalls, all doable over a few days and all worth visiting! 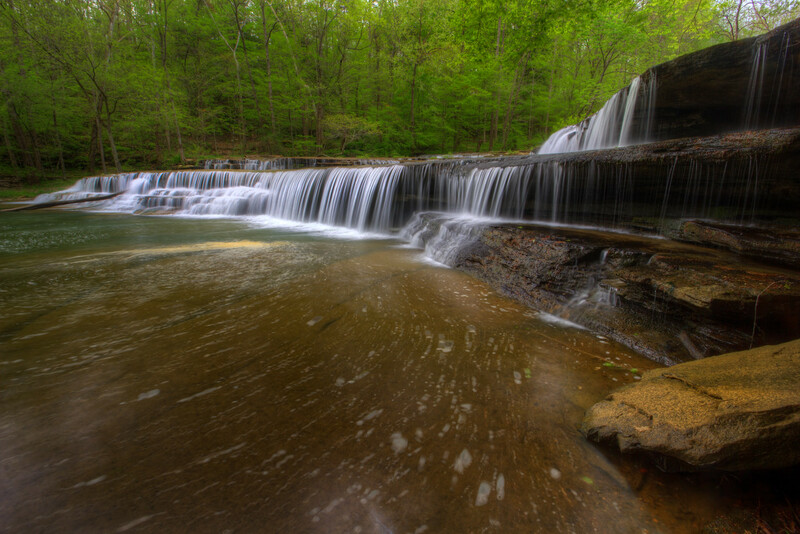 Next, we will be visiting the waterfalls of Eastern Kentucky and maybe I’ll throw in a few arches as well! Until then, happy and safe waterfalling!